A colorful, English-Tagalog bilingual romp from Manilatown through San Francisco Bay, Lakas and the Manilatown Fish presents a modern, colorful tale of the legendary kissing fish. The story begins in a realistic manner: Lakas’s father takes him to the Happy Fish Man to buy a fish to make sinigang. But the fish turns out to be a talking fish and escapes from its tank, kissing people along the way and making them fall “dizzy in love.” It kisses a bus driver and takes her bus, kisses a manong and takes his clothes and teeth, all the while chased by Lakas, his father, the Happy Fish Man, and the manong. When everyone falls into the ocean, the fish jumps in and rescues them. That night, the fish returns home with Lakas and his family and they all eat rice, chile and tomatoes (no fish). 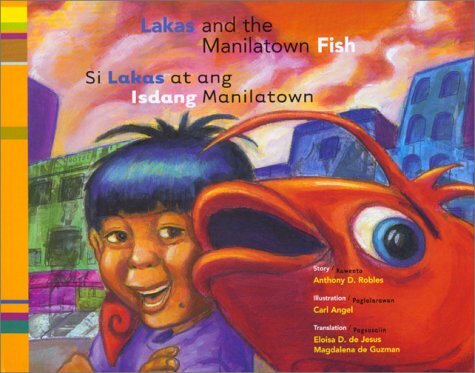 An action-filled story showcasing Manilatown and San Francisco buildings and scenery, Lakas and the Manilatown Fish has the familiar repetition and climactic buildup that will certainly make kids say, “Again!” after each reading. The lovely illustrations by Carl Angel add additional character and color to this striking children’s book. By omilaju in Asian Child, Bilingual, Boy Protagonist, child of an immigrant, First Generation American, immigrant on March 27, 2015 .